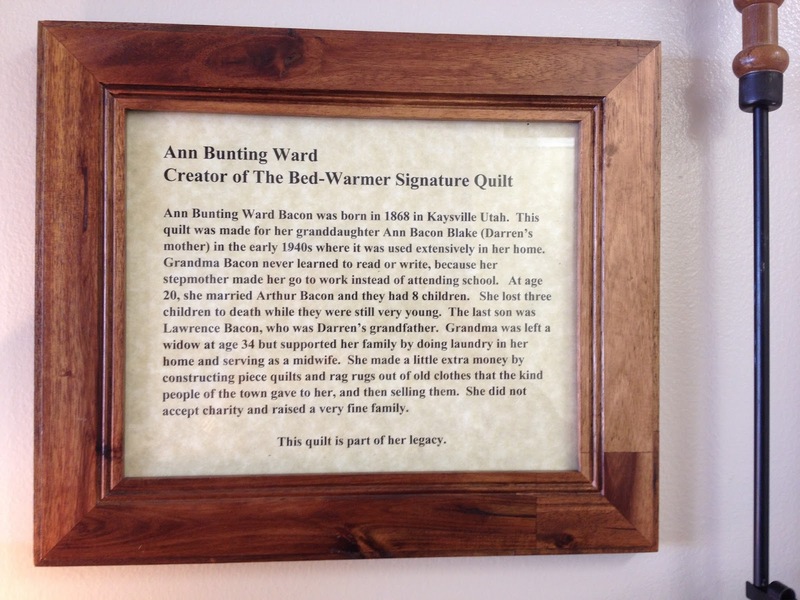 All of you who have been into our store have seen the story of Grandma Bacon's antique quilt: The quilt that became The Bed-Warmer signature quilt. 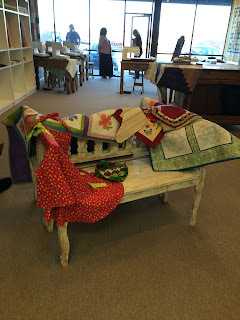 Recently, Darren's sister found two more of Grandma Bacon's incredible quilts made by her mother Ann Bunting Ward. These two quilts are a bow-tie and a double wedding ring patterns. Isn't it amazing that even after over fifty years, we still incorporate the same designs and patterns in our quilts. Although some of our methods and tools may have changed, we are still connected with the past in the most tangible of ways. There is something truly wonderful about being able to wrap up in a quilt made with love and being able to feel the presence of our loved ones past. 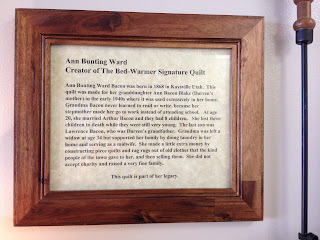 Isn't it also amazing to know that the quilts we make today can be passed down through our generations, perhaps someday being cuddled in by a grandchild or great-grandchild, feeling that same love that was stitched in to every block. We are proud to display these three quilts by Ann Bunting Ward in our shop, and we are honored to help you create beautiful quilts filled with love. 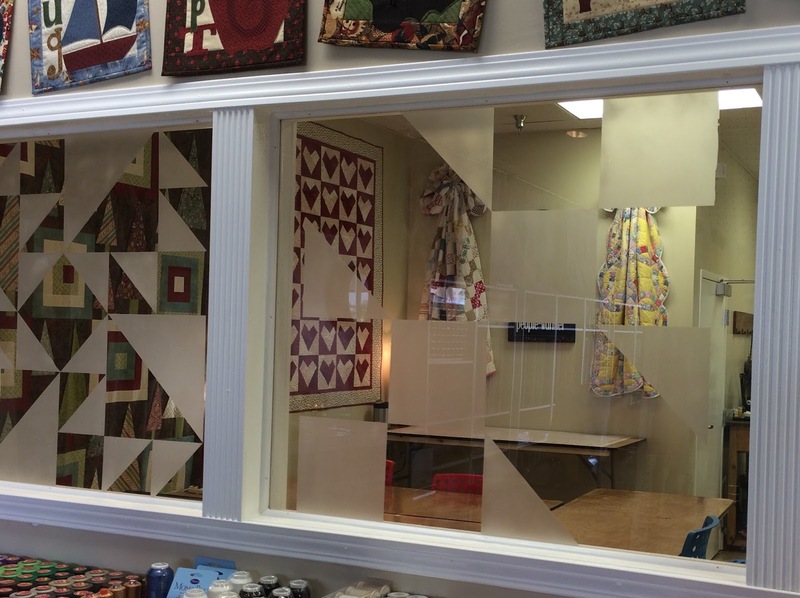 Looking back at the past through our original Bed-Warmer quilt block windows. Learn more and visit us at our website here. First of all, we would like to thank everyone that came to our Grand Opening! We had a wonderful time and met so many great new people. 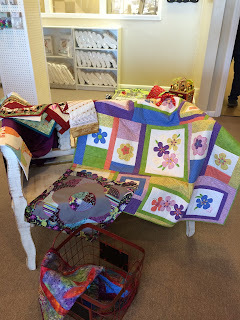 It was so exciting having everyone come experience The Bed-Warmer Quilt & Sew. 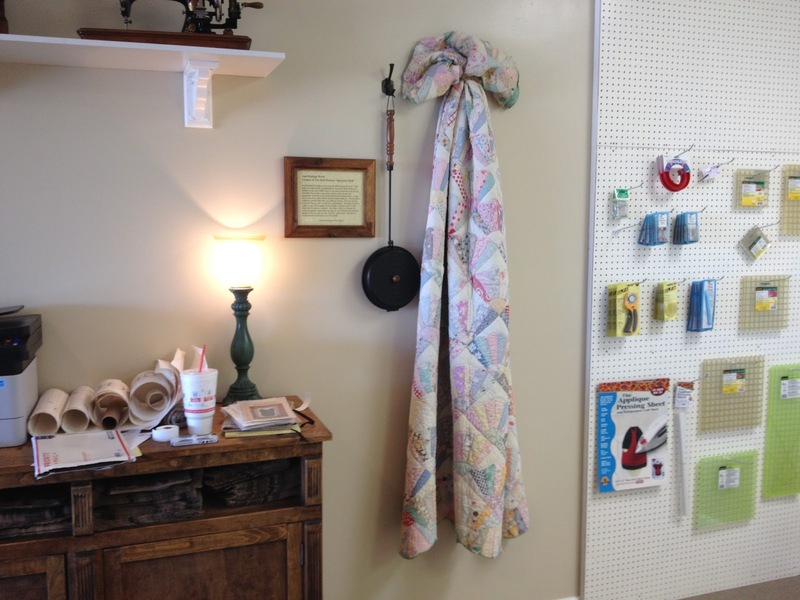 and, probably the most important to us, hang our signature quilt and plaque on the wall. Our signature quilt, the one you will see on our logo, holds very special meaning to us. Ann Bunting Ward Bacon was born in 1868 in Kaysville Utah. This quilt was made for her granddaughter Ann Bacon Blake (Darren’s mother) in the early 1940s where it was used extensively in her home. Grandma Bacon never learned to read or write, because her stepmother made her go to work instead of attending school. At age 20, she married Arthur Bacon and they had 8 children. She lost three children to death while they were still very young. The last son was Lawrence Bacon, who was Darren’s grandfather. Grandma was left a widow at age 34 but supported her family by doing laundry in her home and serving as a midwife. She made a little extra money by constructing piece quilts and rag rugs out of old clothes that the kind people of the town gave to her, and then selling them. She did not accept charity and raised a very fine family. This quilt is part of her legacy. We were very excited to be able to display our signature quilt and share it with y'all. Now, we were ready to open for business! We were honored to have our regional Pfaff representative, Ann Regal and our Pfaff educator, Gina Hodges, join us for our first day of the Grand Opening. It was a very exciting few days and we so loved meeting all y’all that came out. Almost everyone entered our drawing to win a brand-new Pfaff Passport 2.0, and we were excited to see what everybody put down as their favorite type of fabric on the entry cards. We’re getting more and more all the time and we’re glad that we can order the kinds of fabrics that our customers want. 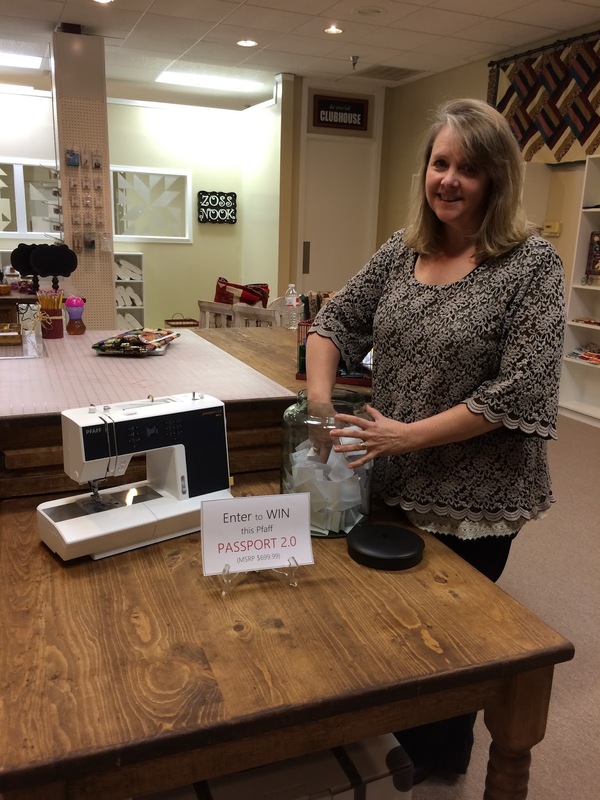 At the end of our opening weekend, we did our drawing for the Pfaff Passport 2.0. 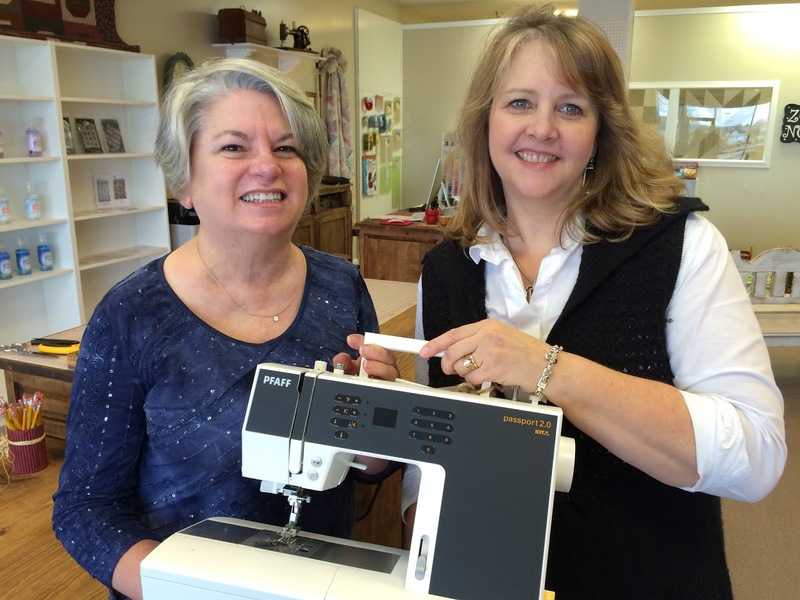 A big congratulations to Holly V. on your new Pfaff Passport 2.0! 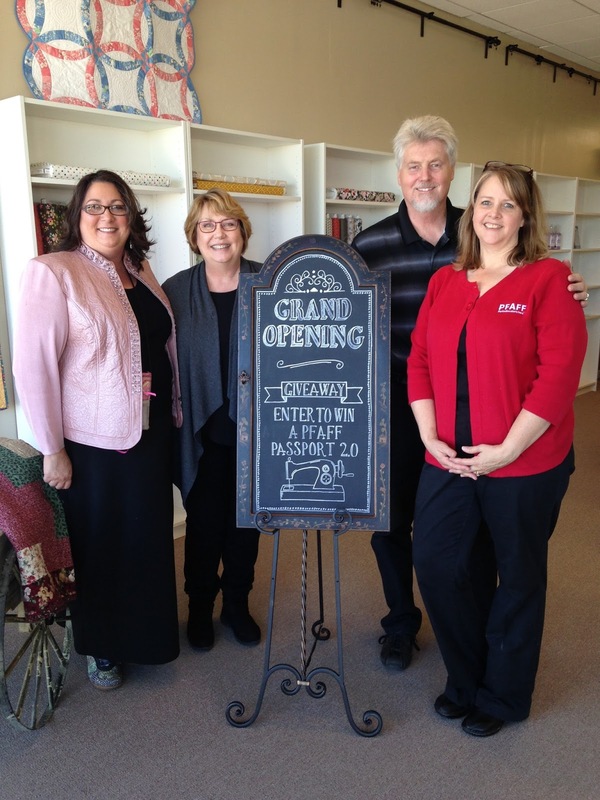 Thank you for coming to the Grand Opening of The Bed-Warmer Quilt & Sew y’all! 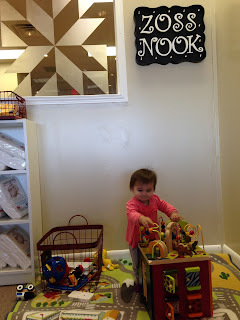 And a big thank you for catching up with us here on the blog. 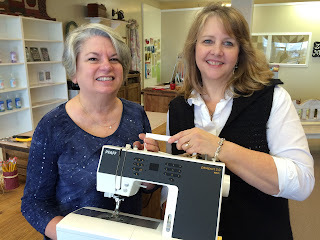 We will be starting a post once a month called Ask Shellie, so don’t forget to submit any sewing or quilting questions to blog@bedwarmerquitandsew.com and don’t forget to visit our website www.bedwarmerquiltandsew.com. Preparing for Our Grand Opening! We had so much to do to prepare for our upcoming Grand Opening! 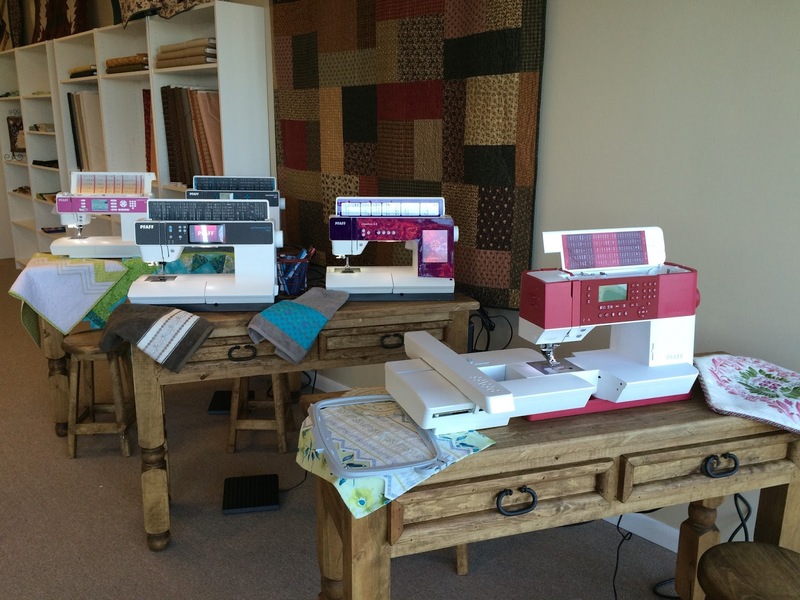 Our store space was previously a cellular store, and we had to do a lot of updating to make it into The Bed-Warmer Quilt & Sew. It was a lot of work, but we sure love how it turned out and we hope you do too! The first change we had to make was definitely a big one. The shop had a curved wall that really threw off the spacing, so it absolutely had to go. We removed our curved wall, but we still needed something to separate our space into the retail area, where you can peruse our fantastic Pfaff sewing machines and various collections of fabric; and The Clubhouse, our multipurpose room for classes, guild meetings, and Sit & Stitch events. So, it was down with one wall and up with another! We constructed the wall, making sure we had perfect spaces for our very special windows. After we had the frame for the wall up, it had to be sheet-rocked and plastered. It took a lot of time and effort, but the wall was up and just needed paint. Oh, and of course our very special windows. Next came painting. The previous owners had certainly made some bold paint choices, but we decided to go with something a little subtler. We ended up with some nice sand-colored walls, but first we had to prime with a white base so that the other colors wouldn’t show through. …and here is our lovely sandy result! Now, back to those very special windows. 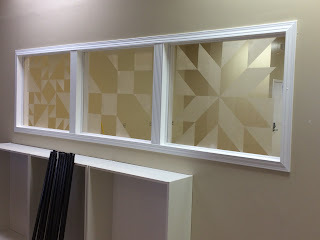 We decided, that instead of having just plain ol’ windows between our retail space and Clubhouse, we would make them very unique to The Bed-Warmer Quilt & Sew. We took quilt block patterns and frosted them onto our windows. To get the look we wanted, we first drew the designs on graph paper, and then enlarged that on the glass and taped off the design. This design is actually an Arkansas Crossroads block! After they were all taped off, we frosted them. After several coats of frost and some time to dry, we took off the tape to reveal unique and beautiful windows! 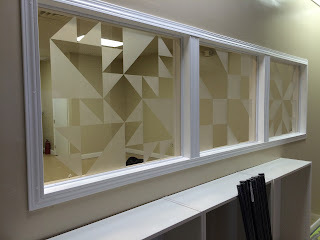 The only thing left was to put our new windows into the spaces in our brand new wall! The rest of our renovation included carpeting and furnishing the shop with tables, chairs, and lots of shelves for fabric! 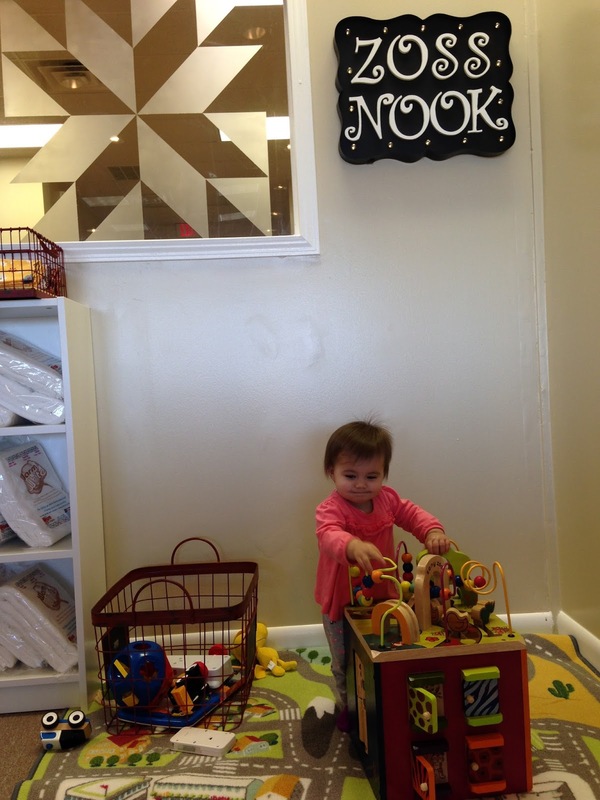 We had a ton of fun fixing up the shop in preparation for our Grand Opening! We’re very excited about sharing it with you! 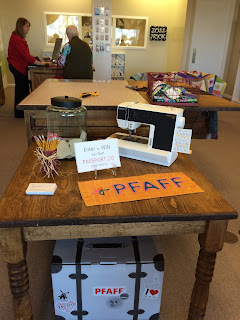 Don’t forget to come to the opening December 3rd, 4th, and 5th and enter to win a Passport 2.0 sewing machine by Pfaff! Can’t wait to see you there! And don’t forget to check out our website at www.bedwarmerquiltandsew.com!